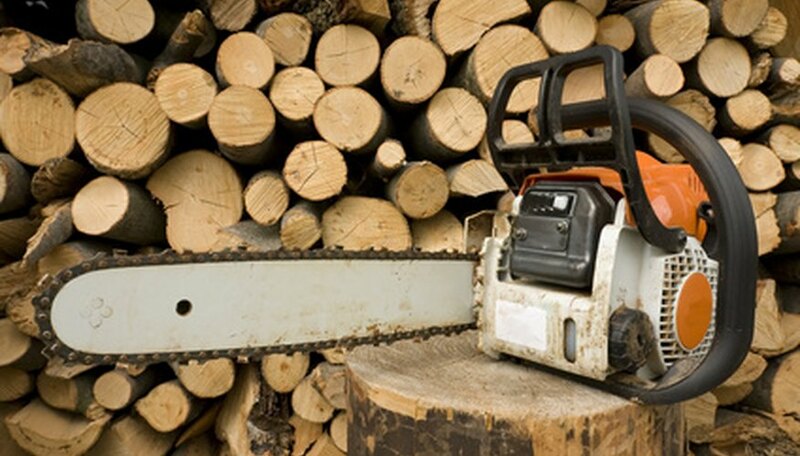 Identifying chainsaw chains is important for the safe operation of a chainsaw. Placing the wrong chain on your bar can be very dangerous for your legs and the saw’s engine. Luckily, manufacturers have come up with an easy set of guidelines for you to determine the pitch, gauge and length of every chain. You should also check on the box the chain came in for these measurements to make sure they match the recommendations for your saw. Use the wrench to remove the bar nuts on the clutch cover. Take off the bar, clutch cover and chain. Determine the length of the chain by counting the number of drive links on it. The drive links are opposite the chain’s teeth and run over the slot on the guide bar. Identify the chain’s gauge. This is the measurement for the thickness of the drive links, so they will need to fit specifically in your guide bar’s slot. This number can be found on the chainsaw chain or on the chain’s box. Most hand-held saws use thicknesses of .050, .058 and .063 inch. Identify the chain’s pitch. This is the measurement between three consecutive rivets on the chain divided by two. The rivets keep the chain links together and determine the size of the chain. Most saws use a pitch of one-quarter to three-quarter-inch pitch, and this measurement can be found on the chain or on the chain's box. Make sure the chain’s gauge, pitch and length all match the recommendations in the user manual. The gauge of your chain must match the gauge of your bar's guide slot. The pitch of the chain must match the pitch of the bar's nose sprocket and drive sprocket. It is dangerous to cut with the wrong type of chain on your chainsaw. Always wear the proper protective equipment when working with chainsaws.